She urged the UK Government to 'come clean' on the expected damage of Brexit on the NHS. Nicola Sturgeon has warned that Brexit will cause the NHS to lose 'millions of pounds'. Ahead of her speech at the National Cancer Research Institute Conference, the First Minister spoke about the dangers of Brexit to healthcare services in the UK and urged the UK Government to "come clean" on exactly how much leaving the European Union will cost the NHS. 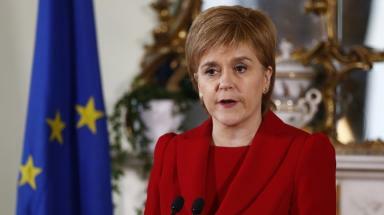 Sturgeon claimed that millions of pounds will be lost in funding for research trials. She also mentioned other dangers, including pharmaceutical companies being told to stockpile medicine in preparation for a no-deal scenario. "Far from the £350 million extra a week promised to the NHS from Brexit, there is growing evidence of mounting costs" she said. "It's now time the UK Government came clean on the scale of the cost to our health service. "The Prime Minister failed to guarantee there would be no interruption in medicine supplies after Brexit. "There is no good Brexit for our health service. Even with a deal we face a loss of millions of pounds in research funding which could hit clinical trials. "The best way to avoid this damage to the health service is to remain in the EU. " Sturgeon also assured that the Scottish Government is doing all it can to mitigate the expected damage Brexit could cause the NHS. A spokeswoman for the UK Government's Department of Health and Social Care said: "The Government is confident of reaching a deal with the EU that benefits patients and the NHS - but we are preparing for all situations and we are working closely with partners to ensure the proper provision of all medicines in the event of a no deal Brexit. "The department is working closely with pharmaceutical companies to minimise costs and we have received good engagement from the industry so far."